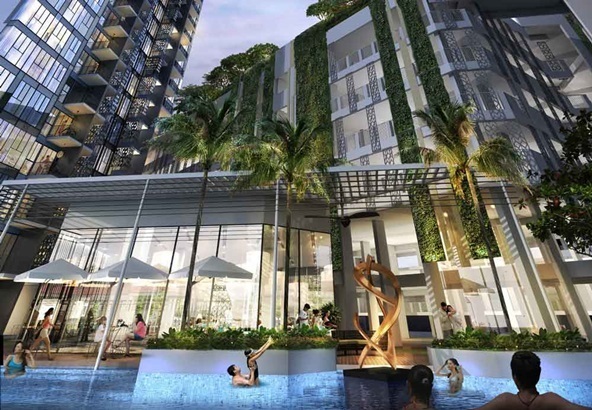 The sales gallery for Gem Residences, the first private condominium to launch in Toa Payoh since 2009, will open (29 April) at Lorong 5 Toa Payoh. Jointly developed by Gamuda Land, Evia Real Estate and Maxdin, the 578-unit project is expected to cater to the pent-up demand for property in the area. A mix of one- to five-bedroom apartments and penthouses are available, with sizes ranging from 452 sq ft for a one-bedroom unit to 2,045 sq ft for a six-bedroom penthouse. Aside from standard facilities such as a tennis court, gymnasium and landscaped gardens, the condo is offering a new club and condo concept, which includes an international 24-hour concierge service, weekly on-site medical consultation, and privileges at Gamuda’s Horizon Hills Golf & Country Club in Johor. The medical consultation service involves a tie-up with Tetsuyu Home Care, and is the first to be offered by a condominium here. Residents can get regular health assessments and medical consultations in their homes from visiting doctors. In addition, there will be an in-house car rental service for residents, which is in line with Singapore’s vision of becoming a car-lite nation. Located near Braddell MRT station, Toa Payoh HDB Hub and established schools, the 99-year leasehold project will be launched in end May, and is expected to obtain TOP in 2020.